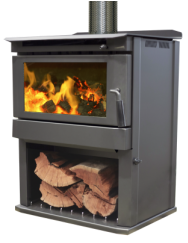 Eureka Woodheating have been a key player in the Australian for over 30 years with their reputation of 100% Australian made range of quality wood heaters. ​The Nugget is a multi-purpose heater used for both heating and cooking. It's a convection heater that allows you to use the top surface as a cooktop. The unit heats up to 120m2. A beautiful bay windowed powerful unit that heats up to 300m2. Features a unique pre-heated primary and secondary combustion air for complete burn. Heats up to 180 square metres and comes compete with a 3 speed fan. Firebrick lined firebox, 8mm steel baffle plate. The Miner is a convection heater that heats up to 260m2 and cones with a 3-speed fan as standard. 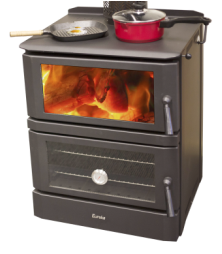 Heats and allows you to cook using the top plate for pots and the lower oven for roasts. Easy to use controls allow you to regulate the oven temperature and the unit has the option to allow you to connect a wet-back system to even heat your water. A medium to large heater that heats up to 240m2 with a powerful 3-speed fan. 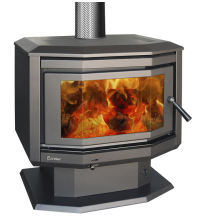 The largest of the range with a huge viewing window and enormous firebox that heats up to 280m2. Comes with a powerful 3-speed fan as standard.